Estimated reading time: 8.7 mins. Last week I was at an inaugural user experience conference in Canberra, UX Australia. Despite some personal issues, over all this was one kick arse conference. It really showed that in Australia we have lots of highly educated and very intelligent UX professionals in terms of speakers and attendees. You know it is a good conference when you glance over the program and you can see that you have conflicts all over the shop as to what you want to see. Even when you apply the old rule to go see the sessions that are outside your comfort zone. There was an essence of distinct maturity of the Australian UX community with this conference, that other attendees pointed out as being world class. We seem, over the years to have stepped up and can now play in the big boys ring. Not that frankly I can see anyone in Australian UX community really giving a damn about what others think, we do just tend to get out there and just do it, instead of the navel gazing of other overseas UX communities. 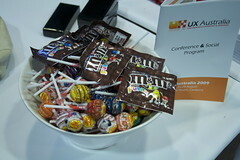 It was the small things at UX Australia that transformed it from a good conference to a great conference. Things like the lolly and fruit bowls on the registration desk, the lightweight but functional recyclable conference bag, excellent food that even I could eat, the useful sponsor bag inserts, usable program on the lanyard (with social networking stuff) , the use of crowdvine, and a paper notebook with a grid layout in it for note taking. As usually the conference wasn’t just about the sessions, it’s about the discussions in the corridors and the social events afterwards. UX Australia was no different, usually in Australia when I attend one of these conferences I know about half the attendees, UX Australia was unique for me this time as a didn’t know most of the people there. Which was a great opportunity. I must have been the only person present, not to have read Alex’s book, Glut. The talk was interesting, travelling through the heritage of information, from the folk taxonomies of pre written language cultures. Which for a Celtic history and sociology buff like me wasn’t that new, but it was interesting to see Alex’s take on the topic. Alex fast tracked through the inventions and theories of the times from the Art of Memory, the Memory Place and the Theatre of Memory through H.G. Wells, Teilhard de Chardin, Paul Otlet and finally Ted Nelson with the introduction of the term “Hypertext”. Proving that what is new is really just old and maybe we do just work in cycles of rediscovery. Personally it did re-enforce a lot of material I already knew about, overall it was a good opening keynote for the conference. Did make me think twice about bothering with Glut however. Darren told us about design visualisations that can be used to show the future solution in operation, and scope out the idea with a visual narrative. However their use will need the strong support of a internal mentor to maintain the serious nature of the visualisations. Interestingly comic book style visualisations work well with senior executives. Still very lo-fi methods can be used like sticky notes, play actors just to get the message across – there are no rules for this method, just the presentation of the content. Matt discussed very bravely about agile UX, a hot topic at best. He pointed out that the one big thing with this is that planning on a micro level doesn’t work with a agile implementation. Planning is for waterfalls. How can you plan and give details on something you have not build. The importance is lots of rapid iterations, sketch, rapid prototype, fast test (2-3 people) and refine. Try and use the same group of testers. Sketch more, document less, no one reads the documentation tomes. He talked about selling Agile – Waterfall – bad, it’s very costly, only 32% are on time and budget. Washing Machine (agile) is good. Reduces cost – but ensure not too much is at stake with first agile project. I enjoyed this session, Lachlan walked us through his experiences, motivations and methodology for redesigning and improving the dashboards for the Atlassian product suites. Now I’m not that familiar with these products, but it was interesting to see his approach and the final results. One major take away was that one person doing cool work can inspire others to greatness, as Lachlan proved. I loved this presentation too, it was just a case study of their work with UNSW and process involved. But it was the process and their take that was refreshing in that they took hundreds of user stories from various user workshops conducted with their clients. They grouped and modelled the stories slowly into the high-level activities and finally they prioritising and condensed them down into the final requirements. In effect the user stories become the requirements, this was UCD at its heart, becoming the business requirements. Wish I had discussed this more with Penny and Michelle at the time. This was a nice end to day one, Shane and Matt walked us through the comparisons of Architecture and Interactive design with the help of Matthew Frederick’s book “101 Things I Learned in Architecture School”, this was highly entertaining and amusing – well I’m never going to look at some calendars the same again. Also Shane and Matt launched this cool interactive design blog in the session as well. Steve discussed his work with the YHA, the use of the UxD approach to the selection of IT systems. I dearly wish I had discussed Steve’s process with him 6 months before as I could have saved a few of my clients some very costly mistakes. The key was that people had to get inside their customers shoes and extend the experience beyond the single transaction into a welcoming experience, especially if they where a repeat customer. Nothing really new here, it was just the approach of changing the focus from the business and the staff to the customer as the primary focus that was so simple but rarely done in practice (well in Perth anyway). Stephen discussed that data rich interfaces don’t have to be that heavy. He reminded us that data is a series of discrete pieces of information. Data in it self is not information with form. Discussing that knowledge management is required for creating data rich interfaces. Don’t know if I full agree on this one. He looked at Comprehensible Data and Actionable Data. Noting that we do not change the data, we contextualise it. You have to understand the data enough to be able to expose themes and patterns. You have to take the time to study and muse over the date. Waiting for the patterns to appear. Guido presented a demonstration of itsme, this is different approach to the old boring desktop model. Guido walked us through the design process and logic. He highlighted the use of the metaphors of “venue” and “story” which was extremely left of field. This is was a very refreshing approach, best bit is it seems to be working according to the user testing. Just goes to show that the previous user experience can be shaken off and refocused on new ideas at times. Jürgen’s presentation really made me stop and think. We really are just sometimes just over engineering you UX solutions. His team’s simple approach to the problems of the double-decker cargo train electromechanical systems was amazing. Just using simple things to prototype was again sketching in it’s rawest form. It was great to see that it was possible to be involved in such a interactive project. Still one year for the train engineers to build the prototype would drive one batty! Will looked at social experience design, touching on Identity, Presence, Relationships, Reputation, Groups, Conversations and Sharing (in a Morville’s damn honeycomb). Was a very good presentation, I could see a number of people’s minds going pop in the session. Better ways to consider social experience design, helping with the development of deeper, boarder targeted strategies that focus on the aspects of planning, design and deployment of the relevant social media community platforms and general social networking platforms. Going to have to think on this one a bit more. Again another great way to end the day. For me this was a very important session, as selling UX is the biggest issue I have with the local market. Daniel spelt it out very plainly, we are just too damn techy, we have to get back to business speak, we have to get back with the people we are working with and understand them as people and business owners. Sure we have our UX lingo, but that is only good for communicating with other UX professionals. This is just like the old IT industry. Sad we have got like this! I can say I’m looking forward to UX Australia 2010 in Melbourne, which is a city I love! I have already pencilled in the week for next year. How was UX Australia for you. Did you get the same impression, particularly if it was your first conference.